device. In the GRAPHINIUS project we design, develop and experiment with an open access Web-based machine learning platform allowing experts and end-users alike to visually compose state-of-the-art processing pipelines. The great advantages of the GRAPHINIUS approach lies in the JSVM’s nature of receiving its configuration and programming from the outside, providing easier access to the platform, automatic sharing of Web-server stored experiment meta-data, as well as greater comparability and reproducibility of results. Eventually, faster research cycles hold the promise of yielding greater scientific output throughout the international computational science community. 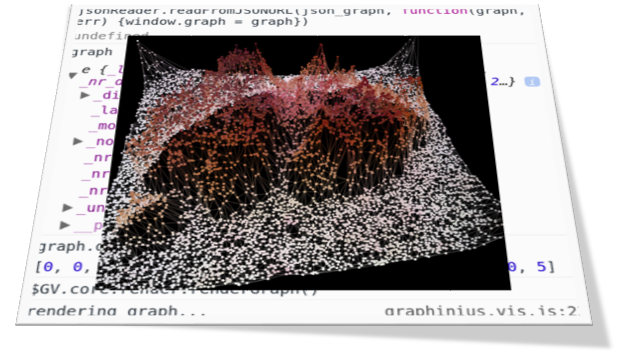 The framework GRAPHINIUS allows to set up crazy experiments with graph-based data. Holzinger, A., Malle, B. & Giuliani, N. 2014. On Graph Extraction from Image Data. In: Slezak, D., Peters, J. F., Tan, A.-H. & Schwabe, L. (eds.) Brain Informatics and Health, BIH 2014, Lecture Notes in Artificial Intelligence, LNAI 8609. Heidelberg, Berlin: Springer, pp. 552-563, doi:10.1007/978-3-319-09891-3_50.